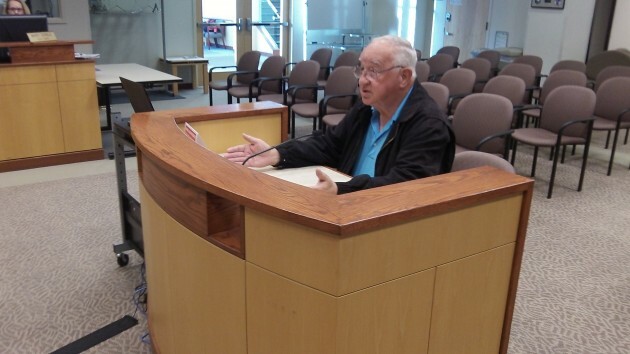 Ray Hilts asks the city council Wednesday to consider a local gas tax to fix streets. It’s early yet, and no one knows how far this idea is going to go, but there’s been talk of Albany voters being asked what they think of a local gas tax to pay for repairing city streets. The subject came up most recently at the city council meeting Wednesday night. Ray Hilts, an Albany resident long active in community activities, appeared before the council with a suggestion. As everyone knows, he said, many Albany streets are in poor shape. So isn’t it time to consider a local gas tax and start fixing them up? Or words to that effect. Mayor Sharon Konopa has brought up the idea of a local tax gas before. She’s also talked about it to Mayor Biff Traber of Corvallis, whose budget committee also has considered the possibility. The mayors’ idea is that voters in the neighboring cities would be asked the same question at the same time, perhaps in the general election Nov. 8. Konopa had been waiting to push the idea until after the primary, waiting for the outcome of a gas tax election in Portland. There, voters now have approved a 10-cent-per-gallon city gas tax that will be in effect for four years. The outcome has encouraged Konopa to think that perhaps voters in Albany and Corvallis would react the same. As the rate of the local tax, she’s been talking in terms of 5 cents. So far it’s not known how much that would raise, but the mayor would like it to be spent strictly and only on street repairs — not new streets or bike lanes or sidewalks or any other extras such as transit improvements as in Portland. I’ll be happy to spend my gas money at a station outside the incorporated area. The Mayor is attempting to CONSPIRE with other mayors to get all cities to enact the “same” tax. We have crumbling streets, yet the city wants “promenades” and such downtown. Why not just tear down the old buildings downtown and build a theme park? The “carousel” is the first step. More wisdom emanating from the northern end of a southbound horse. Spoken like a fly as it “enjoys” my droppings. Crumbling, crumbling infrastructure everywhere. Yet no one wants to “chip in” & help pay to fix it even in our little corner of aMErica. A mentality of I’ve got mine and no one is going to claw it away prevails. What does this say about the current state of our society? I haven’t purchased new tires in some time and today’s prices will probably shock me. Thinking “we” use up more money in tire expense running over rough roads than a plus 5 cents per gallon. Just a guess …. If I were an Albany resident, I’d likely not oppose a nickel per gallon gas tax that was strictly dedicated to street repair; on a trial basis with a four year sunset clause as Portland has done. However, what I find difficult to understand, with all the local, county, state and federal taxes collected from me on an ongoing basis, why the streets are not already maintained and in good repair. Is it because the bureaucracy consumes the large portion of those dollars and inefficiencies occur throughout the system? The answer is simple. Those taxes are being spent on other things. The biggest LIE that has been perpetuated over the last 60 years is that there is all this “wasted” tax money. The biggest amount you pay for local government is your property tax, and only a portion of that goes to the city. Of the amount the city gets, you can chalk that all up to two basic things: Police and Fire. End of story. For Gas tax, most goes to the State for the cost of state roads. Somewhere around 1/4 ends up with the City, and only from the gas sold in the City. It’s a pittance of the cost of maintaining roads. For the city to get to “perpetual maintenance” of roads, they would have to clear up close to 100 years of deferred maintenance. The reason is simple; not one’s willing to pay, they want a free lunch. I am just back from a month in Spain. Freeways are magnificent, the way they were here in the 60’s. I took a train that was fast and comfortable. That ran at 180 mph. The roads had virtually NO potholes, and that went for the local and farm roads too. Some patches here and there, but you would not believe it unless you see it for yourself. Why? Because the European Union saw how the US invested in the 50’s and 60’s and they learned while we forgot. We forgot because Reagan and the radical conservatives sold the country on the idea that government is the problem. Roads, water, sewer and a whole host of infrastructure is provided by government. Surprise! So if folks want to know why things are so bad, they ought to look in the damn mirror. It is heartening to learn that tax dollars have not been wasted in the last sixty years. One person’s waste is another persons necessity. Both the government and the private sector are run by humans and humans make mistakes all the time. The difference is that business spending is secret to the outside world. Government spending is public, audited annually, and constantly open to press and public review. Having worked in both the private and public arena I don’t see a huge difference, except that government workers are more risk adverse and rule adherent which thereby makes it harder to change. This is directly the result of public policies adopted by both legislative dictate and voter initiatives/referendums that demand such adherence. In regards to streets, public contracting sets the costs in the open marketplace for projects. And it is extremely expensive. Albany residents should be thankful that ORS 319.950 requires the city to submit this tax to the electors for approval. Otherwise this city council would unilaterally impose the tax. This council hates having to get voter approval for anything. The only question is will the council try to sell this tax to voters as ‘temporary’? No one should fall for that lie. I would have no problem with it, if… If that is actually where the money ended up. For some reason I just don’t trust that it will actually make it to its intended place before being borrowed or loaned to something else. As someone sitting on the fence about voting on various races this November, I’m discouraged by the obviously Republican/Libertarian attitude of many/most of the comments. The need is real; the tax proposed is the best way to pay for it. Even Portland’s ten cents is small compared to price changes caused by minor rumors. The notion of spending significant time and effort to spite the tax is absurd. Fighting this one is just choosing the wrong battle. If reasoning like this, and hints of theocracy and stupid drug policy from non-libertarian Republicans are what’s on offer, count me out. At least zero Ayn Rand quotes and associated fringe rants here! Unlike those found over on the shrinking paper’s website.